The process of buying a home in the St. George area has many elements to consider and an earnest money deposit is an important one. Earnest money is a deposit that a potential St. George buyer presents to a seller as an expression of commitment to the purchase of a property. An earnest money deposit also goes toward the buyer’s eventual down payment. This is a critical aspect of the Southern Utah home buying process because without it, people could make many offers on many homes simultaneously which would effectively take each property off the market until the time when the buyer makes a choice on one of them. There are very few scenarios in the St. George, UT area where a seller will accept an offer of any kind without a deposit. When a seller finally accepts the buyer’s offer (made in conjunction with an earnest money deposit), that deposit money immediately goes toward the down payment and closing costs. How Much Should An Earnest Money Deposit Be? That depends. There a handful of factors that will determine the appropriate amount such as particular requirements from the seller, the St George real estate market, and state limitations/policies. In most cases, one to two percent of the home’s purchase price is used as an earnest money deposit. As previously mentioned, the real estate market in the area where the home resides can have an impact on earnest money, potentially swinging the deposit amount up or down. For example, you may only have to give one percent (or even less) in areas where buyers are scarce. And of course the opposite is true in high-demand areas. Additionally, it goes without saying that a buyer who presents a larger earnest money deposit typically has a greater chance of winning the bid. Bigger deposits often result in sellers lowering the purchase price of the home, as well. Know that when buyers present large deposits on a Southern Utah home they truly want, a verification process initiated by the bank will likely take place to make sure that the source of the funds is legitimate, particularly if the funds have been in the buyers possession for less than 60 days. At What Point Does The Earnest Money Need To Be Paid And Who Manages It? Typically, in St. George, the earnest money deposit is received by the title company and held in escrow once an offer has been accepted and the purchase agreement has been signed (real estate agents may also hold it at their brokerage). It will be held there until the concluding stages of the sale at which point they will be discharged from escrow and become part of the down payment. Depending on the state, management of the deposit may be handled by the real estate broker. Do not give the deposit directly to the seller, ever. In a situation where something goes wrong, that money could potentially be difficult or impossible to get back from them. It’s always a good idea for the buyer to perform their own verification process by checking the credentials of the St. George broker or firm who is set to manage the earnest money deposit. 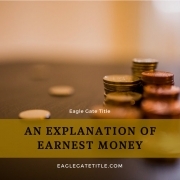 For further information about earnest money deposits as well as answers to any other questions you have, please do not hesitate to give us a call. We would be honored to help you in any way that we can, whether it be about this particular topic or any other relating to the purchase of your future home. Eagle Gate Title is Southern Utah’s most trusted title company.